The latest edition of Eucalypt, the bi-annual newsletter of the Australian Association of Friends of Botanic Gardens (AAFBG), is now available. 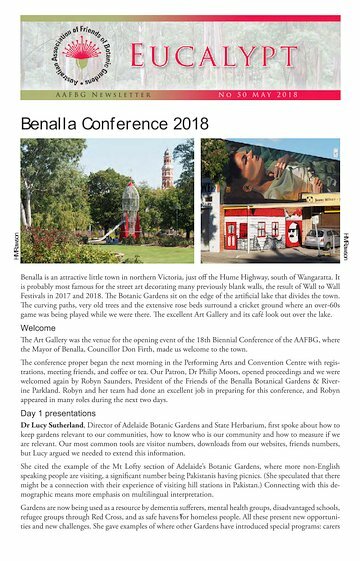 In this edition, read all about the AAFBG biennial conference, held at Benalla back in April. Benalla has a heritage Botanical Gardens with many ancient elm trees, on the side of an artificial lake, surrounding an oval on which an over-60s cricket team was playing while we were there. The first speaker at the conference was an old friend, Lucy Sutherland, now Director of the Adelaide Gardens. There were heaps more speakers, all detailed in this issue, plus an article about Camperdown’s use of Instagram, the ‘Care for the Rare’ project being introduced in Victorian Gardens, the Pangarinda BG where the Murray joins Lake Alexandrina, and details of the 2020 conference in Brisbane.